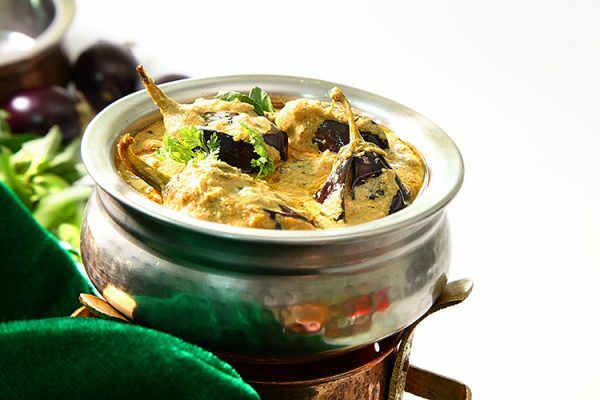 Stuffed aubergine with masala paste served with naan bread, roti or rice. Wash the aubergines and slice into halves with the stem still attached to the aubergine. Add the aubergines to a bowl of water with some salt, and fully submerge and soak while the rest of the dish is being prepared. Shallow fry or roast the onions in 3 tablespoons of oil until they are light brown (about 8 - 10 minutes on a low heat). Then grind the onions into a paste using a pestle and mortar or a food blender. Shallow fry the peanuts, poppy seeds, coriander seeds, sesame seeds, charoli seeds, coconut, fenugreek seeds, mustard seeds, red chillies and cinnamon in 2-3 tablespoons of oil. After frying grind this all into a fine paste to form a masala mixture. Mix this ground masala with the Bhojwar masala powder and the ground onion paste. Stuff the aubergines with about ¾ of the combined paste and keep the remaining paste separate. Shallow fry the curry leaves, ginger and garlic paste, turmeric and the remaining masala paste in a saucepan. Add the stuffed aubergines and fry on a low heat till they soften (try to keep them intact). Add the tamarind paste and a little water. Cover the pan with a lid and cook on a slow heat till tender (approximately 15 - 20 minutes). When almost cooked, check taste for salt and add if required. Finish with chopped coriander leaves and serve with naan bread, roti or rice.